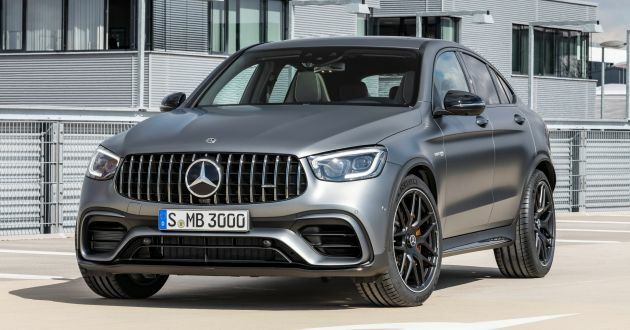 The new Mercedes-AMG GLC 63 facelift has just been unveiled, less than two months after the updated X253 Mercedes-Benz GLC was introduced. Just as you’d expect, the range-topping model gets all the upgrades first seen with the new GLC, although not much tinkering has been done mechanically. Let’s start with the obvious. The SUV gets refreshed LED headlights with new LED DRLs, new LED tail lights design with ring-shaped graphics, 20-inch AMG alloy wheels (21-inch units available as option), revised 90 mm twin trapezoidal tailpipes, as well as a brand new graphite grey metallic paint. It’s the same story inside – everything but the trim has been carried over wholesale, meaning the digital instrumentation and upgraded Mercedes-Benz User Experience (MBUX) from the updated GLC are included, though they each feature AMG-specific functions and displays. MBUX is linked to the freestanding 10.25-inch touchscreen head unit, and cabin trims include appropriately-themed carbon-fibre items. The sports seats with integrated head restraints are carried over from the current GLC 63, although customers can now choose the new magma grey/black upholstery with yellow contrasting topstitching. A new addition here is the AMG steering wheel with Touch Control buttons and LCD display integrated into a round controller – the latter is linked to the car’s AMG drive programmes. Over to the performance. Under the bonnet rests the same M177 4.0 litre twin-turbo petrol V8, which in standard tune makes 476 hp at 5,500 to 6,250 rpm and 650 Nm of torque at 1,750 to 4,500 rpm. The hotter S model gets uprated to 510 hp and 700 Nm of torque, and both engines are mated to the same AMG Speedshift MCT 9G transmission that routes power to all four wheels (4Matic+). The century sprint time is unchanged from before as well. The regular GLC 63 gets from zero to 100 km/h in 4.0 seconds, whereas the GLC 63 S manages in 3.8 seconds. Top speed is electronically limited to 250 km/h and 280 km/h respectively. One thing to note – all performance figures are identical between the GLC 63 and GLC 63 Coupe. However, the latter model is marginally more fuel efficient, with a combined reading of 12.3 litres per 100 km (280 grammes of CO2 per km). The normal-bodied GLC 63 has an average rating of 12.4 litres per 100 km (283 grammes of CO2 per km). Both figures are based on European NEDC standards. Other features include AMG Ride Control+ and AMG Dynamics, the latter comprising six drive modes – Slippery, Comfort, Sport, Sport+, Individual and Race (S model only). Like the existing model, drivers can use the buttons in the centre console to directly select manual transmission mode, preferred suspension level and also the exhaust system. Also available are the three-chamber air suspension with adaptive dampers, an AMG high-performance composite braking system and an electronic rear-axle limited-slip differential. For cross country drives, one can opt for the Energising pack, which uses lighting, air conditioning and music moods to help with relaxation.